Masonry destroyed at the Cornmill Heritage Centre in Coalisland. Photos provided by local SDLP councillor, Malachy Quinn, who visited the site. Vandals who wrecked flower beds and kerbing at the Cornmill Heritage Centre in Coalisland - which has only recently benefitted from a major regeneration project - have been lambasted by local politicians for their “disgraceful” actions. Mid Ulster Council said they were “deeply disappointed” at the incident, believed to have taken place some time after 4am on Sunday May 29, while calls have been made for CCTV in a bid to deter further destruction of property. The council spokesperson said a clean-up operation would be carried out “in-house”, and it’s unclear if there will be a cost associated. Coalisland councillor, Joe O’Neill, said he and members of the public helped to clear the area around the Cornmill after he was inundated with calls from people eager to give their support. The Sinn Fein representative for the area said there had been an “outcry” from the local community following the incident. Meanwhile, Torrent SDLP councillor, Malachy Quinn, said he was “absolutely disgusted” at what had taken place. Cllr Quinn continued: “We work hard here in our town to try and bring in money to improve it and now just months after the Cornmill has been fixed up we have these thugs come in and wreck it. “I have had numerous phone calls and messages from people who are extremely angry at this and if anyone has information about who these people are then I ask them to bring it to the PSNI. 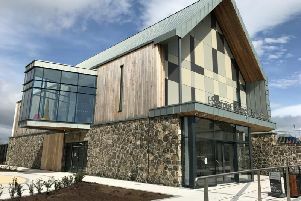 A Mid Ulster District Council spokeswoman said: “The Council is deeply disappointed at the vandalism that took place last weekend at the Cornmill, Coalisland, especially since that area has recently benefitted from approximately £100,000 improvement works under DSD’s Revitalisation Scheme. The damage will be repaired in-house.